Edward Ewell (Eddie) Anderson. Image available on the Internet and included in accordance with Title 17 U.S.C. Section 107. Anderson worked on newspapers in Oklahoma, Arkansas, Fort Worth, and Tyler, before settling for a time in Abilene in the late 1920s. While working for Max Bentley on the newly established Abilene Morning News, he covered the trial of Marshall Ratliff, ringleader in the Santa Claus Bank Robbery. In 1930 Anderson worked his passage on a freighter to Europe and back. He returned to Abilene, where his parents and three sisters had settled, to try seriously to write fiction. A year later he began collecting material for hobo fiction by riding freight cars across the nation. He returned to write a picaresque novel about an out-of-work musician hoboing aimlessly around the United States. He also wrote short stories about hoboes, and Story magazine accepted two of them. Edward and Polly Anderson. Image available on the Internet and included in accordance with Title 17 U.S.C. Section 107. Hungry Men by Edward Anderson. Image available on the Internet and included in accordance with Title 17 U.S.C. Section 107. Anderson married Polly Anne Bates in Abilene in 1934. They went to New Orleans, where he sold pieces to detective magazines and worked on a New Orleans newspaper. His hobo novel, Hungry Men, was published by Doubleday, Doran, and Company in 1935. It won the Doubleday-Story Prize that year and was a Literary Guild selection. Anderson returned to Texas and lived in Kerrville, where he began work on a second novel about two desperadoes who resembled Bonnie Parker and Clyde Barrow. Thieves Like Us by Edward AndersonImage available on the Internet and included in accordance with Title 17 U.S.C. Section 107. 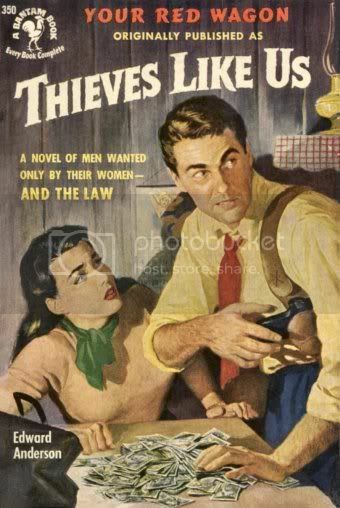 By the time this second novel, Thieves Like Us (1937), was published, Anderson was working for the Rocky Mountain News in Denver, where he also wrote a successful radio series. After good reviews of Thieves Like Us Anderson went to Hollywood, where he worked for B. P. Schulberg at Paramount and for Warner Brothers. When his screenwriting faltered, he worked for the Los Angeles Examiner and the Sacramento Bee. By1846 the Andersons had four children. Anderson returned to Texas after World War II and worked for the Associated Press and the Fort Worth Star Telegram, among other papers. His marriage ended in divorce in 1950. For a time he took to the road again and drifted almost as much as he had during the early 1930s. He wrote for an underground newspaper in New York at one time. He then drifted back to Texas and lived principally at Brownsville, where he eventually married a Mexican national named Lupe. They had a son and a daughter. In 1955, he moved to El Paso, where he worked for the El Paso Herald Post. He wrote two pulp detective stories based upon the 1917 murder of Thomas Lyons in El Paso. Anderson's later fiction projects did not reach print. After two years of retirement from newspaper work, he died of heart disease on September 5, 1969, in Brownsville, and buried at Buena Vista Burial Park. Thieves Like Us has been made into motion pictures twice, as They Live by Night in 1948 and as Thieves Like Us in 1974. In 1985 Hungry Men was reissued. Handbook of Texas Online, Patrick Bennett, "ANDERSON, EDWARD EWELL," accessed April 19, 2019, http://www.tshaonline.org/handbook/online/articles/fan38. Uploaded on June 9, 2010. Modified on September 28, 2016. Published by the Texas State Historical Association.